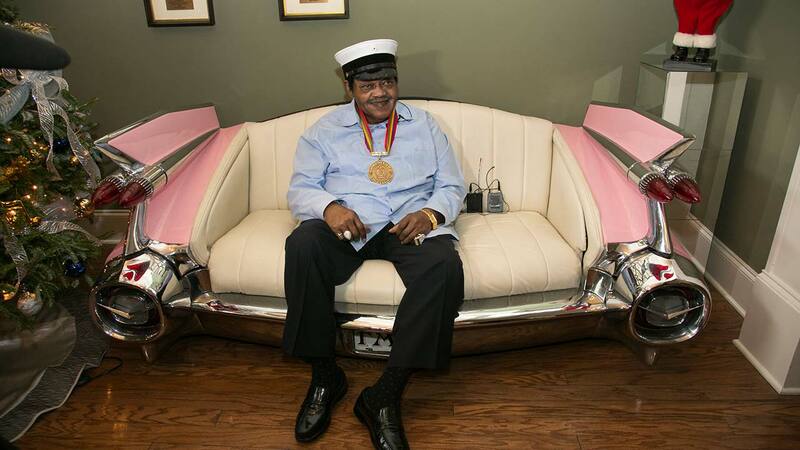 NEW ORLEANS -- Fats Domino, the amiable rock 'n' roll pioneer whose steady, pounding piano and easy baritone helped change popular music while honoring the traditions of the Crescent City, has died. He was 89. Mark Bone, chief investigator with the Jefferson Parish, Louisiana, coroner's office, said Domino died of natural causes early Tuesday. In appearance, he was no matinee idol. He stood 5-feet-5 and weighed more than 200 pounds, with a wide, boyish smile and a haircut as flat as an album cover. But Domino sold more than 110 million records, with hits including "Blueberry Hill," ''Ain't That a Shame" - originally titled "Ain't It A Shame"- and other standards of rock 'n' roll. "We've lowered the flag and we're playing his music all day," said Greg Harris, CEO of the Rock and Roll Hall of Fame. He said artifacts including original manuscripts of "Walking to New Orleans," ''I'm Walkin'" and "Blueberry Hill" were on display. "On behalf of the people of New Orleans, I am eternally grateful for his life and legacy," New Orleans Mayor Mitch Landrieu said in a news release Wednesday morning." Fats Domino added to New Orleans' standing in the world, and what people know and appreciate about New Orleans." His 1956 version of "Blueberry Hill" was selected for the Library of Congress' National Recording Registry of historic sound recordings worthy of preservation. But in May 2007, he was back, performing at Tipitina's music club in New Orleans. Fans cheered - and some cried - as Domino played "I'm Walkin'," ''Ain't It a Shame," ''Shake, Rattle and Roll," ''Blueberry Hill" and a host of other hits. "Fats embodies everything good about New Orleans," his friend David Lind said in a 2008 interview. "He's warm, fun-loving, spiritual, creative and humble. You don't get more New Orleans than that." The son of a violin player, Antoine Domino Jr. was born on Feb. 26, 1928, to a family that grew to include nine children. As a youth, he taught himself popular piano styles - ragtime, blues and boogie-woogie. Fats Waller and Albert Ammons were early influences. "They call me the Fat Man, because I weigh 200 pounds," he sang. "All the girls, they love me, 'cause I know my way around." In 1955, he broke into the white pop charts with "Ain't it a Shame," covered blandly by Pat Boone as "Ain't That a Shame" and rocked out decades later under that title by Cheap Trick and others. Domino enjoyed a parade of successes through the early 1960s, including "Be My Guest" and "I'm Ready." Another hit, "I'm Walkin,'" became the debut single for Ricky Nelson. Domino appeared in the rock 'n' roll film "The Girl Can't Help It" and was among the first black performers to be featured in popular music shows, starring with Buddy Holly and the Everly Brothers. He also helped bridge rock 'n' roll and other styles - even country/western, recording Hank Williams' "Jambalaya" and Bobby Charles' "Walkin' to New Orleans." Like many of his peers, Domino's popularity tapered off in the 1960s as British and psychedelic rock held sway. "I refused to change," he told Ebony magazine. "I had to stick to my own style that I've always used or it just wouldn't be me." Antoine and Rosemary Domino raised eight children in the same ramshackle neighborhood where he grew up, but they did it in style - in a white mansion, trimmed in pink, yellow and lavender. In 1988, all of New Orleans seemed to be talking about him after he reportedly paid cash for two Cadillacs and a $130,000 Rolls-Royce. When the salesman asked if he wanted to call his bank about financing, Domino smiled and said, "I am the bank." In 1998, he became the first purely rock 'n' roll musician to be awarded the National Medal for the Arts. But he cited his age and didn't make the trip to the White House to get the medal from President Clinton. That was typical. Aside from rare appearances in New Orleans, including a 2012 cameo spot in the HBO series "Treme," he dodged the spotlight in his later years, refusing to appear in public or even to give interviews.